An eatery owner had the presence of mind to slow down and stop a passenger train by waving a red shirt at Ghughumari near Coochbehar yesterday morning after a youth in the village had shown him a crack on tracks. 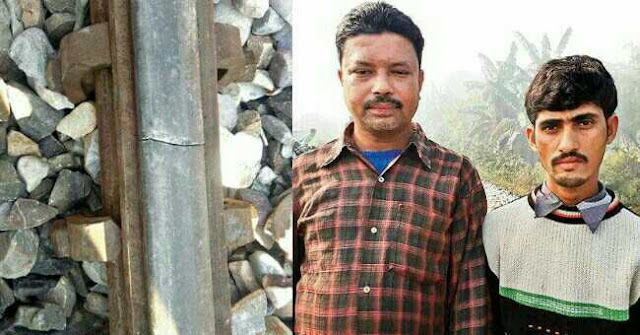 Although railway officials said the crack was a minor one, with the Andhra Pradesh train accident fresh in their minds, they praised the manner in which Madhab Das, 40, had made the driver of the Alipurduar-Bamunhat Passenger apply the brakes. Railway sources said the crack, if left undetected, would have widened and could have caused derailment. Das, who runs a small eatery at Ghughumari, 7km from here, said he should not be the only one to take credit for stopping the train. "It was around 7am when a youth of our area, Bappa Rajbhor, saw the crack and came and told me. The crack was just across the railway bridge that spanned the Torsa river. I and he went to take a look at the crack. Just then, I heard the whistle of an approaching train that had left Cooch Behar station and was going to Bamanhat," said Das. "I was wearing a red shirt and I took it off and started waving at the train. At first, the driver did not notice me. But when he saw us waving the shirt and shouting, he applied the brakes. As we jumped off the tracks, the train came to a halt. But not before the wheels of the engine and two bogies had passed over the crack," he added. Das said the driver of the train had got off and thanked him. "The driver told me that we had rightly stopped the train and anything could have happened." Sanjib Rajbhor, a resident of the area, said the train waited at the spot for nearly an hour. "All passengers, numbering a few hundred, got off the train. Many of then walked to the Ghughumari bus stand to take buses to their destinations," he said. North Bengal development minister Rabindranath Ghosh visited the spot. "The presence of mind of a villager prevented an accident. The railways should be more vigilant as there are frequent derailments that have caused many casualties," Ghosh said. The manager of the Northeast Frontier Railway's Alipurduar division, Sanjiv Kishore, said the crack was a minor one. "The crack was a minor one and has been repaired. However, we are happy that local people have acted promptly. We are trying to contact Madhad Das and will recommend his name to our higher ups for felicitation."